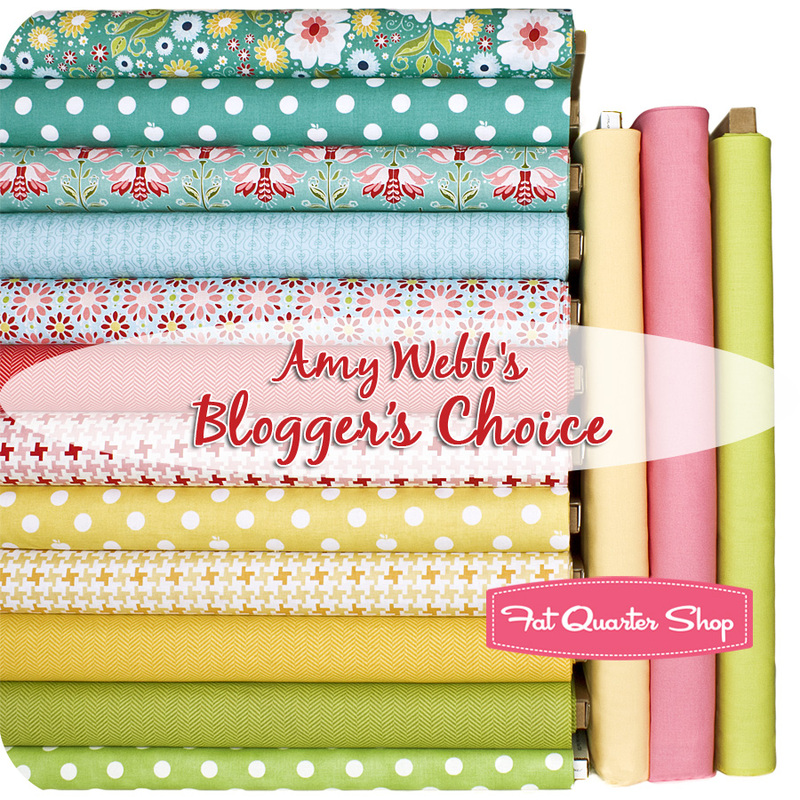 Miss Print: It's Giveaway Time - Amy Webb's Blogger's Choice! I love, love the Tradewinds fat quarter bundle by Lily Ashbury. It is gorgeous! Oh, I am also a follower. Thanks so much for the chance to win such beautiful fabric! I love the new Quilt Blocks line of fabric! Thanks for the gorgeous giveaway! I have been eyeing the Quilt Blocks Fat Quarter Bundle at the FQS. I really like the "Tea Party" quilt pattern. I really like Allison's Pow-Wow pattern! Very tempted to pick that one up! I like the little sprouts quilt pattern. I love the Michael Miller Gray Font-abulous fabric. There are actually a lot of things I love there, but that's definitely one of them. It would be too unoriginal to mention Flea Market Fancy so I'm going to say I'm loving the look of the Valori Wells 'Cocoon' fabrics. Just don't ask me to be too specific about which I prefer the moth, butterfly or caterpillar!! Wow so many fun new items but what caught my eye is the Wiggly Pet Park Fat Quarter Bundle. I love the colors and the prints. I really like Cluck Cluck Sew's new pattern Inside Out. I live the Lily Ashbury designer select fat quarter bundle. So Pretty!! I'm torn between the Lucy dress pattern and the Tie front dress pattern. Both are so sweet! Oh I love them all, but Valori Well's Cocoon would be the first thing I'd buy if I could. My-an awful lot to choose from! I really like the Maasai Mara line from Dear Stella for clothing & I think the Spin Cycle pattern is too cute! I love the new Pow Wow quilt pattern by Cluck Cluck Sew! Saw it on her blog and fell in love! Great giveaway!! Flea Market Fancy's still on the newest additions page, so I'll definitely be going with that. Major fabric crush on it! ;) Thanks for the chance! I also follow your blog. Have a fantastic weekend! I am a follower with RSS! I love Mod Squad by Dan Stiles. Such cute fabrics. 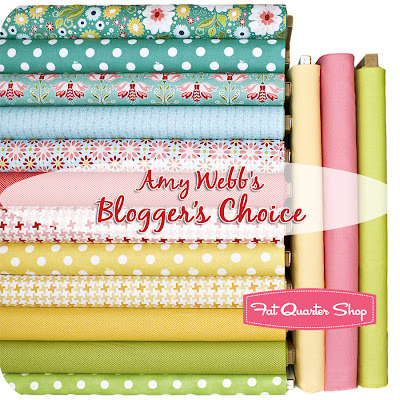 Amy Webb's fq choices just whisper loudly to me. Love the dots, the flowers, all of it. i love the quilt blocks line! Liking the Spin Cycle quilt pattern! The Quilt Blocks collection is so awesome! I like almost every print. Thanks for the chance! I like the Mod Pod and the Cocoon lines. I really am smitten with the new Quilt Blocks. Thanks for giving us a chance! My favorite: The new Kate Spain Christmas line. Ah... love the new color palette this year!!! I just love Sentiments fat quarter bundle. It is no very pretty. Thank you for this wonderful giveaway chance!!! I love the Purchased Flea Market fat quarter bundle!! I am also thinking I need the Beach Bag pattern by V & Co. Soooo cute!!! Ok so Butterfly Cocoon by Valori Wells for Free Spirit Fabrics is what I'm currently in love with. Love that purple! HELLO! 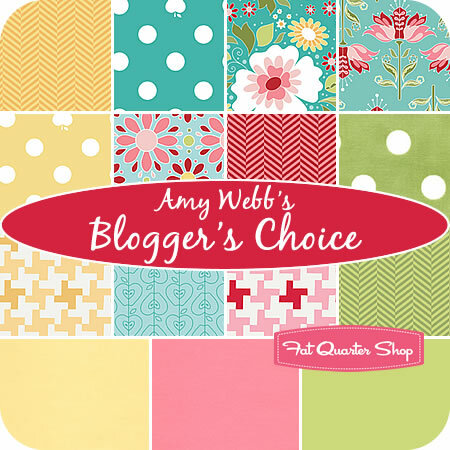 I'LL CHOOSE AMY WEBB'S 'BLOGGERS CHOICE'! I LOVE THESE FABRICS-CUTEST I'VE SEEN IN A WHILE! HOPE I WIN,IF NOT I CAN BUY THEM-YEA! THANK YOU MISS PRINT+FQS FOR SHARING ANOTHER GREAT GIVEAWAY! Costume clubhouse - the web prints LOVE THEM! I love the quilt block bundle! I love next stop! Thanks for the chance. I love the mod squad scooter fabric! Oh, those are definitely Spring colours, I love them. What a gorgeous bundle of fabric goodness! My favorite is the FQ bundle of the new Quilt Blocks fabric! I also love the new Facade pattern. I've got my eye on a bundle of Joy by Kate Spain. My favorite new addition is Tradewinds by Lily Ashbury! Shimmer by Timeless Treasure is catching my eye. What a charming bundle you're giving away. My favorite things on the new additions page are the V and Co. patterns--can't choose between Dandelion and Little Sprouts. Love the Mod Squad Organics. Thanks for a great giveaway. I follow you in Google Reader. Love this giveaway. i love Next Stop by Monaluna. I love Amy Webb's Blogger's Choice Bundle! You're right, perfect for a spring/summer quilt! My mind is already going to patterns that would work perfectly with that fabric. Off of the Newest additions page on the Fat Quarter Shop site, I'm really digging Joy by Kate Spain and Tradewinds by Lily Ashbury! I love the cone zone fat quarter bundle. So cute for a little boy. I just love the London Fog Batiks! I'm wishing I had the money right now to go ahead and order it. Thanks. I love the colors in Tradewinds -- and Wiggly Pet Park is also fun. I have my eye on the chevron fat quarter bundle! I realllly love the Just Dandy Quilt pattern. So gorgeous! I really like the Pow-wow pattern! Oh i think its a tie between the cocoon fabric bundles and the first one that loaded and grabbed my eye, Picnic Party! So much to like! I love the Cross Country and the Next Stop. But the holiday lines are just too cute also! I love being a follower of your blog! Thanks so much! LOVE the new Spin Cycle quilt pattern - it would look great with this fabric bundle! I like the Tradewinds Fat Quarter Bundle. The Next Stop Organic Grey Captured yardage caught my eye. Love the cameras. I am a follower, you have good recipes. My fav is Shimmer by Timeless Treasures. So gorgeous. I would love to win Amy's pick. How awesome are those fabrics. So pretty. Thanks so much for the chance to win. I love the Costume Clubhouse green web fabric, so darn cute! I'm in love with the Mod Squad FQ bundle. I love those faded out colors. So pretty. I love the Quilt Blocks line, great colours and design. Love Picnic Party Black Sweet Cherries! I like the Pow-Wow Quilt Pattern and the Urban Zoologie Garden Zig Zags Yardage. I like Picnic Party. It is such a bright and cheerful collection. Yes, I do follow your blog!! It's a tie between 'Summersville' and 'Quilt Blocks' -- gotta have them both I guess. That bundle for the giveaway is so nice, thanks for the chance. The Joy fq bundle by Kate Spain is yummily delicious! I've followed you for a very long time! I'm partial to the Pet Park fabric with the goldfish in a fishbowl. My favourite is the Just Dandy Quilt pattern by V & Co. Amazing!! I like the Woodland Ginko Stonehinge fat quarters. Hi i love the Mod Squad and Next Stop collections. Thanks fir the chance. My favorite from the Newest Additions page at the Fatquarter Shop is the Kenya Maasai Mara Fat Quarter Bundle by Dear Stella Fabrics! I love the Picnic Party Ladybug print and I'm totally crushing on the Pow-Wow pattern from Cluck Cluck Sew! I really like the Shimmer fat quarter bundle. yes, I'm a follower of your blog. I am a follower of your blog....thank you for the wonderful giveaway!! And I love the flea market fancy FAQ bundles! I love the shimmer,looks so yummy and exotic! I follow your blog :) thanks for the giveaway!! I really like the Mod Squad fat quarter bundle by Dan Stiles. Thanks for the lovely giveaway. I guess Barefoot Roses. The fabrics are getting way too modern for me. My favorite is the Joy fat quarter bundle. I really love TradeWinds by Lily Ashbury! I'm a follower of your blog ~ thanks for the giveaway! I just love the ladybugs on Picnic Party! London Fog Batiks Fat Quarter Bundle from Island Batiks Fabrics is an eye popper! that's my pick! Purchased flea market fancy is my favourite. Thanks so much! I am already a follower of your blog too! Do I have to pick only one of what I like for the newest? I don't think I can! I really like the Kenya Maasai Mara. Or the Butterfly Cocoon, Mod Squad. Or even the picnic party looks so much fun! I've been telling my husband I would do a chess board picnic blanket and how fun would that look in the ebony ginko stonehenge? The ModSquad line is my favorite, not that I could ever afford it, lol. I like the Friendly Pet Park Fat Quarter Bundle very cute, thanks for the give away. A great combination for a picnic quilt! I'm in love the Pow Wow!! LOVE IT! And I LOVE that fabric bundle as well. So bright and pretty. I am a follower of your blog. I love reading your posts, thanks so much for sharing. I am a follower of your blog.. I love the Mod Squad FQ bundle.